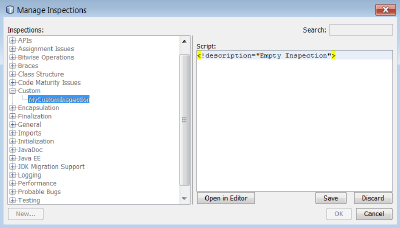 Every inspection is provided with a description available either in the Description field or in the Manage Inspection dialog box. 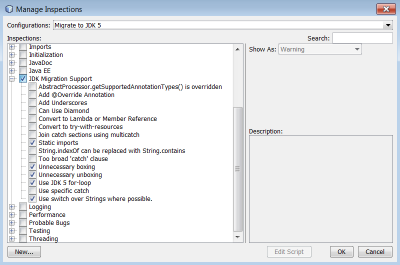 Choose Refactor > Inspect and Transform from the IDE’s menu. 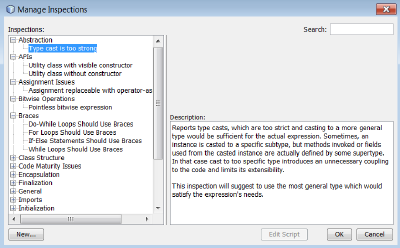 Click Inspect in the Inspect and Transform dialog box. 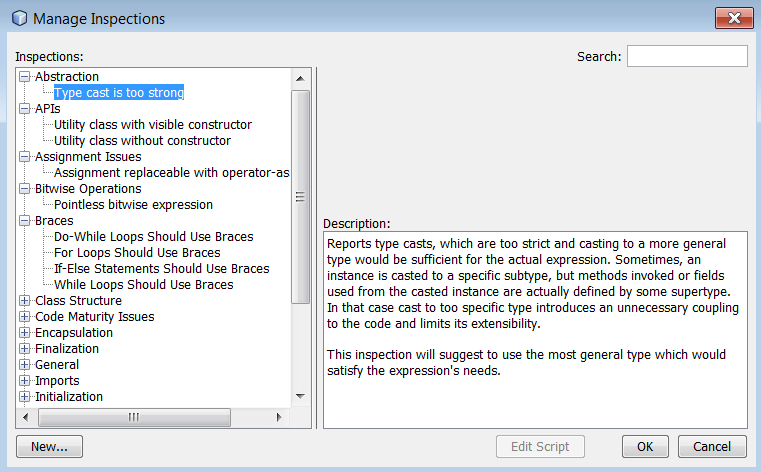 The suggested refactoring changes display in the preview panel. 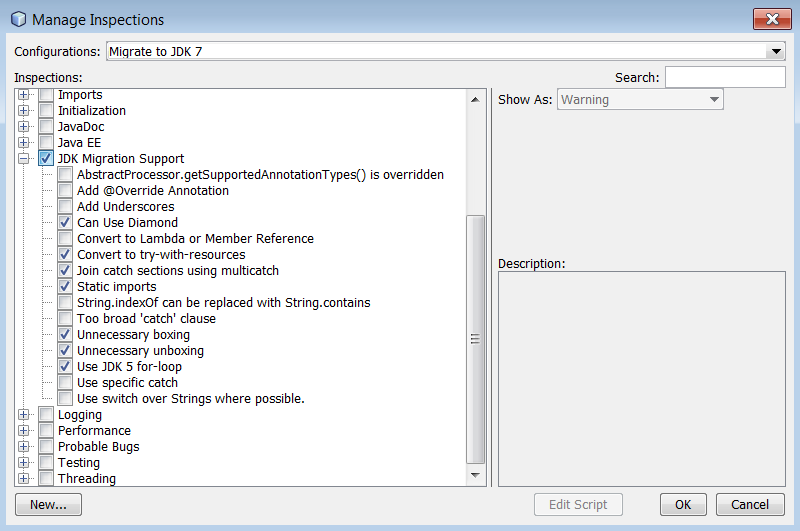 Not all releases of the JDK introduce new language features. 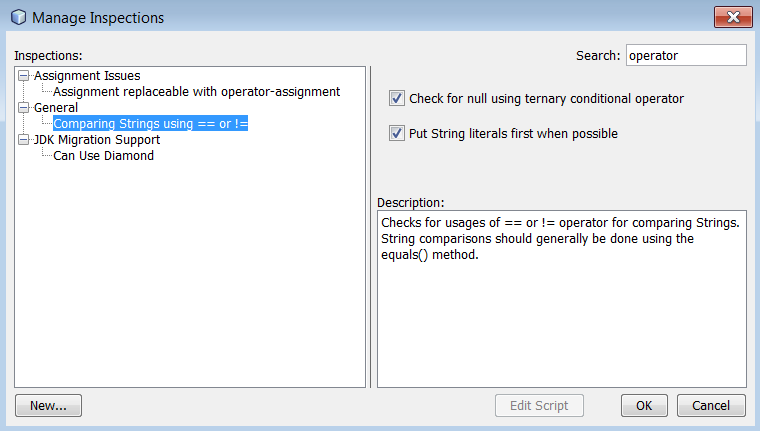 The list of refactorings in the configuration can be modified in the Inspections list of the Manage Inspections dialog box by selecting and deselecting the items under the JDK Migration Support node. Click Inspect. 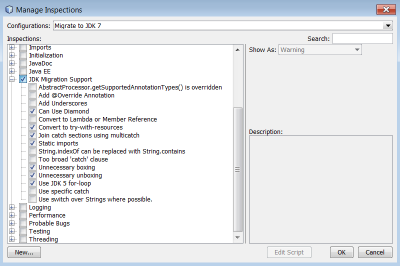 Changes that convert the code to JDK 7 syntax display in the preview panel. Click Inspect. 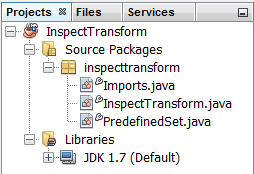 The preview panel displays one occurrence proposed for the Import section of the Imports.java file to make it aligned with the specified code style rules. 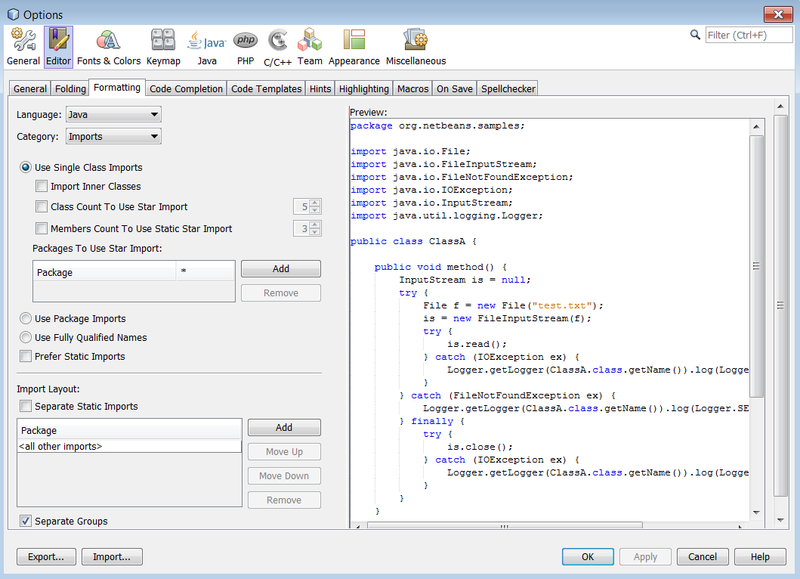 To avoid adding a duplicate inspection to the IDE, choose Refactor > Inspect and Transform from the main menu, click either Manage or Browse, and, in the Manage Inspections dialog box, use the Search field to look for the required inspection prior to creating a new inspection. 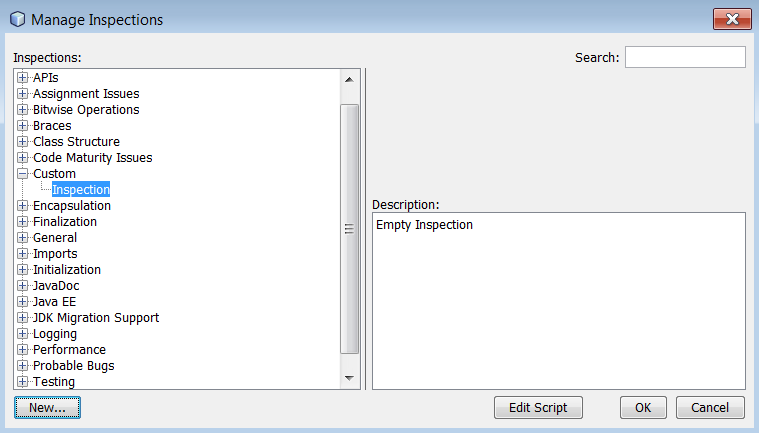 In the Manage Inspections dialog box, click New. 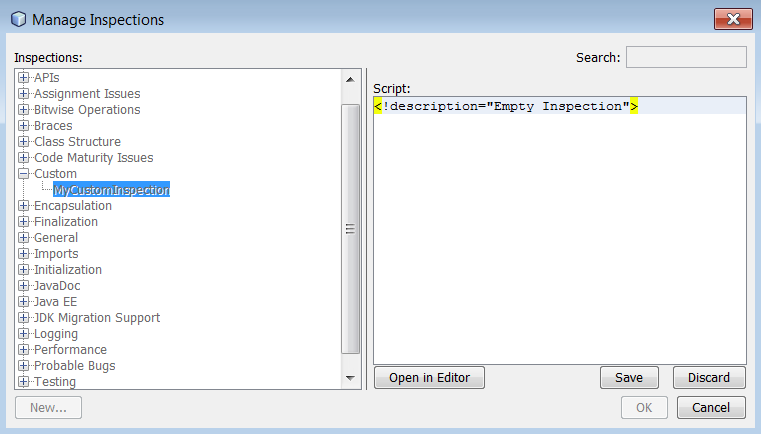 A Custom > Inspection node is created in the Inspections list. 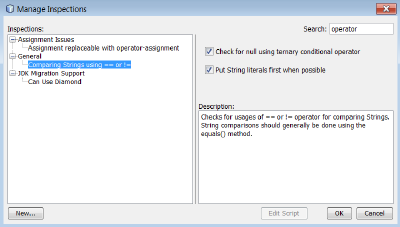 (Optional) Right-click Inspection , choose Rename from the popup menu, specify the name required for your custom inspection (for example, MyCustomInspection ), and press Enter. 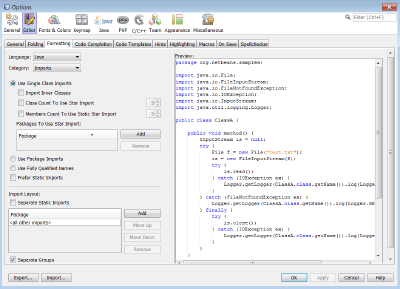 Click Save below the Script text area or press Ctrl + S in the Editor to save your edits. 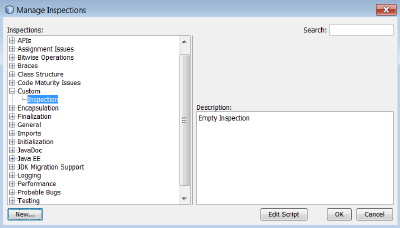 Click OK to close the Manage Inspections dialog box or close the MyCustomInspection.hint file in the Editor. Your custom inspection is done and ready to be applied. Click Inspect. The suggested refactoring changes display in the preview panel.